The focus of this paper is to further a discussion of codes of ethics as institutionalized organizational structures that extend some form of legitimacy to organizations. The particular form of legitimacy is of critical importance to our analysis. After reviewing various theories of legitimacy, we analyze the literature on how legitimacy is derived from codes of ethics to discover which specific form of legitimacy is gained from their presence in organizations. 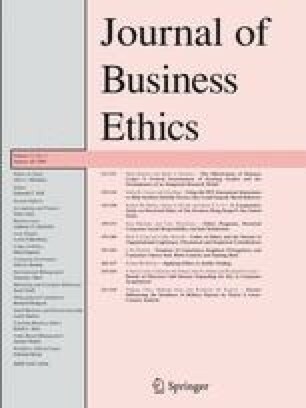 We content analyze a sample of codes to consider the question of whether a strategic, self-interested rationale lies behind the adoption of a code of ethics. We propose that the process of employing codes of ethics in this strategic manner has become, through isomorphism, an institutionalized practice that itself confers a cognitive form of legitimacy to the organization and further distances the codes from their moral foundation. The authors would like to thank the two anonymous reviewers for their constructive efforts to improve this paper.